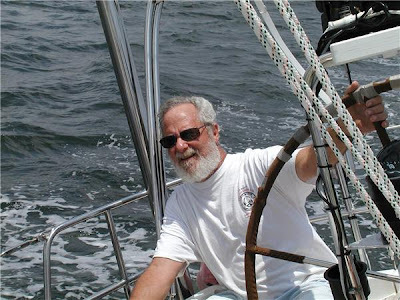 Don is happiest when he is at the helm of the boat. And when he's happy, I'm happy. Many of my quilt designs come from pictures I took on our cruises. Sailing has been a huge part of my life. My husband has sailed all his life. When we worked, we sailed on the weekends. When we retired we started cruising the islands. We'd leave Virginia in mid October , sail down the east coast to the islands and return the beginning of June the following year. It was great fun and we saw amazing places. We also saw all the neat seaports on the east coast from the perspective of the water as opposed to seeing them from a land-locked view. What a huge difference that was. We did that from 1996 until 2003. Then in 2004 we moved to southwest Florida. Here you can sail all year long without making the 7-8 month commitment to living aboard. So since we have lived here, we are doing more day sails which is really nice. And Don (my DH) is racing with a local club. 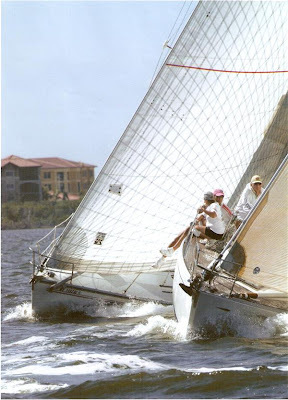 The picture below was taken during the Leukemia Cup Regatta this spring that we participate in each year. Our boat is the one on the right. 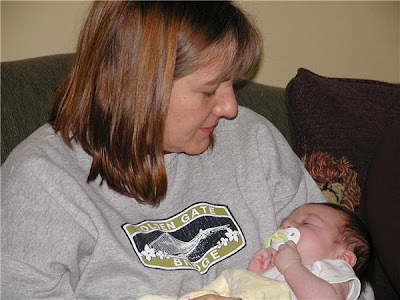 And another passion, grandchildren, this picture is of Aunt Mary with Fiona, my youngest granddaughter born in November last year. Just so we don't leave Mary out of the conversation! Not the most flattering photo of me but the baby is cute! Don looks like he's having a wonderful time.